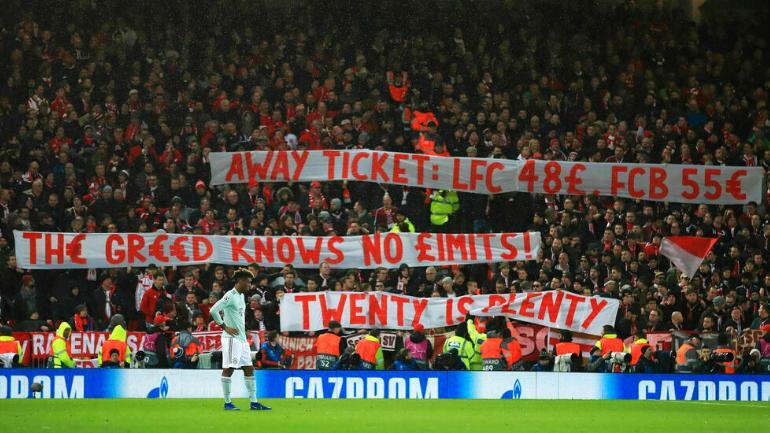 Bayern Munich fans protested the cost of Champions League tickets during a game against Liverpool this week. The Football Supporters’ Federation launched a campaign in England to cap ticket prices for visiting supports at £20 in 2016. Earlier this month, Premier League clubs unanimously agreed to cap away tickets at £30 for the next three seasons, however, this price does not apply to Champions League games. During the Bayern v. Liverpool game at Munich’s Allianz Arena on Tuesday, Bayern fans unveiled three banners at the away end which read: “Away ticket LFC 48£ FCB 55€”,”Th€ gr€€d knows no £imits!” and “Twenty is plenty.” Liverpool fans applauded the action, momentarily uniting the teams. This isn’t Bayern’s first protest; back in 2015, Bayern protested against Arsenal with a banner that read “64 pounds a ticket but without fans football is not worth a penny,” and in 2017, fans threw fake money onto the field after being charged £100 to watch the tie-breaking game. The first leg of the Munich v. Liverpool Championship League match ended in a tie, as neither teams scored a goal. The second leg is slated for March 13 at Allianz Arena.